SOUTHFIELD — You might’ve noticed recently that the city of Detroit has seen a surge of support. Near and far, from T-shirts to Cadillac commercials, the struggling city is gaining hordes of fans who believe Detroit is headed for a comeback. And what better way to show your allegiance than to head downtown and explore all that Detroit has to offer? That’s exactly what Linda Yellin set out to do when she started giving informal tours of Detroit’s Eastern Market to friends in her spare time. Now, 10 years later, the clinical social worker has grown her small walking trips into Feet on the Street Tours, a Southfield-based company that offers a variety of outings, classes, tours and other programs that highlight Detroit’s rich culture and social life. 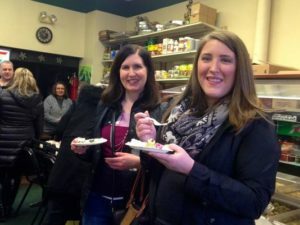 “The tours are not only showing Detroit off to visitors, but also to people in the suburbs who want to connect or reconnect with the city,” said Yellin…. 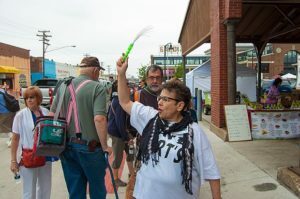 Recently, she invited her sisters from Philadelphia, Syracuse, N.Y., and Prescott, Arizona, to sample a “Feet on the Street Tour,” a day before Barbara was scheduled to sing with the choir at Jefferson Avenue Presbyterian Church in Detroit. On this day they would try roasted nuts at Rocky Peanut, smoked Gouda cheese paired with raspberries at DeVries , coffee and tea at Beyond Juicery, pizza at Supinos and mixed fruit and nuts at Germack Pistachio Company. Here’s a recent piece in The Detroit News. Our tour guide waves a plastic fiber optic light wand over her head. “I try to hold this thing up, but most people say it just makes me five-foot-four,” she says. Education: Bachelor’s and master’s degrees in social work from Wayne State University. Last career: Mental health therapist and consultant in private practice, specializing in pre- and post-adoption services. 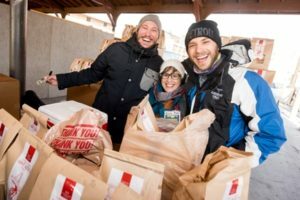 New career: Founder of Detroit-based Feet on the Street Tours, which offers bus, walking and bike tours centered on food, art, architecture, history, music and unique neighborhoods. Why she decided to change careers: While continuing her day job as a social worker, Yellin began taking people on informal tours to places such as Eastern Market. She said the draws were similar to her profession in the field of social work — doing something she believed in, wanting to make a difference and reaching out to the community. “It evolved over time from a personal interest,” Yellin said.